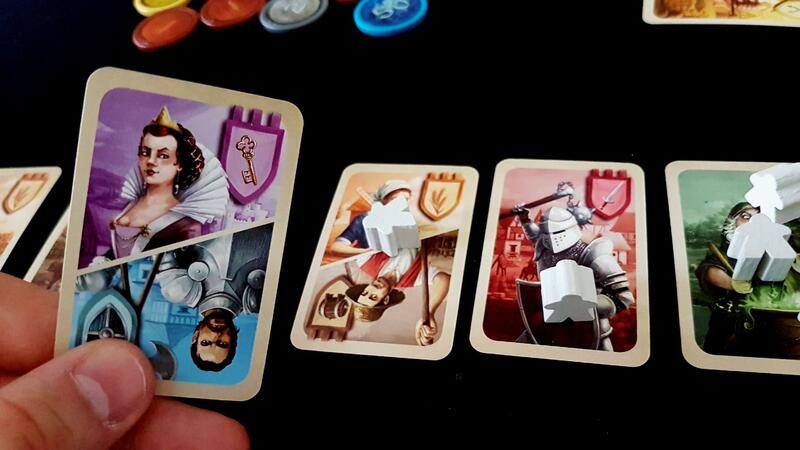 Majesty is a game that’s something of a disappointment. It comes relatively hot on the heels of Splendor – a perennial favourite from the same designer. It has all the hallmarks of the ‘tricky followup album’ that appears in the wake of unexpected chart-topping success – there’s a lot of expectation, a lot of scrutiny, and it’s clear that some of that tension rubbed off on the output. Majesty feels like a timid game. It’s tentative. It clearly knows that it has big shoes to fill and equally clearly has no real idea of how to do it. It’s not that it’s bad, or poorly designed, or even lacking in its own quiet understated fun. It’s just an unnecessary game in a landscape where nobody has time to play all the necessary ones. There is no part of Majesty that isn’t implemented with more enthusiasm and more verve in other games. It feels listless and empty as a result. Almost as empty as the dead air inside the ridiculously excessive box. At its core, Majesty is a tableau builder except you already begin with that tableau in place. Maybe a better way to think of it is as a human resource management sim. Your job is to staff the various buildings in your town so as to support the nascent infrastructure of capitalism that has up until now lain mercifully dormant. You start off with a handful of workers, a few cards, and big dreams. Well, moderate dreams. Well, dreams. Everyone has the same starting resources and you all share access to the same underwhelming recruitment pool. Majesty is an attempt to make a game out of fighting over the best pickings available in a disappointing Medieval version of Monster.com. 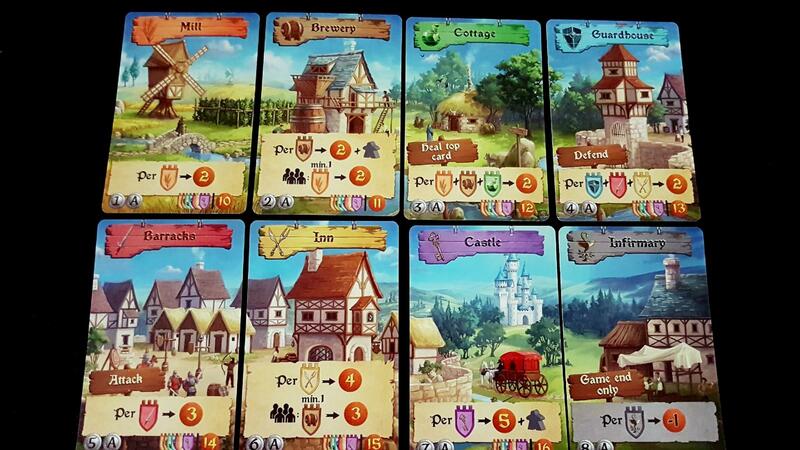 Each of the people on offer has a place in your village, and when you place them you score based on how the building works. You can grab the first card for free, but cards beyond that costs you a worker for each card you must pass over in the recruitment process. It’s like you have to send a peasant to apologies to everyone personally in a weirdly obsequious quirk of HR policy. ‘Sorry you didn’t get the job’, says your worker as they stumble into the waiting room. There are already three people there, each apologizing equally profusely to the same frazzled applicant. ‘I just… I just want to go home’, weeps the rejected candidate. Whoever picks a card gets that specialist and all the workers currently hovering around the unsettled job seeker. Thematically I have absolutely no idea what is going on here. It’s reminiscent of one of those executive head-hunted CEOs who says ‘Okay, I’ll come work with you but imma bring my entourage with me’. Then you get to spend that entourage to recruit other people. You see what I mean about how weirdly timid the game is? This elasticated economy is a solid idea, implemented well in games like Small World and Century: Spice Road but only tentatively sketched in here. Someone seems to have forgotten that this part of the game needed adjusted to make sense before the game went to the printer. One dark day, I’m sure Marc Andre woke up to find a post-it note that had fallen behind the desk. It just said ‘Reminder – Try to change the game so it makes some sense’. So, you pluck a hopeful applicant out of the crowd and haul them up into your village like you’re Springsteen giving Courtney Cox her moment on the stage. Their hangers on mill off into your staff room to await assignment to other duties. Then the real weirdness begins. Let’s say you grab a noblewoman, and assign her to the castle. She gives you five points and another worker, because the nobility are famed for their work ethic. 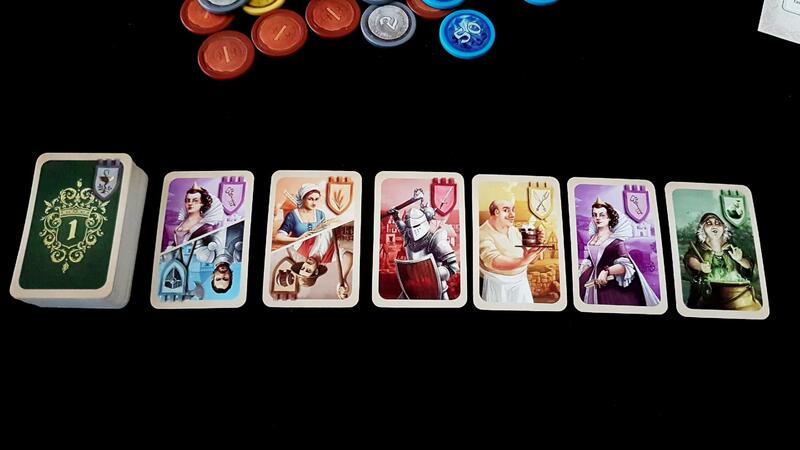 Then you grab another noblewoman and you get… ten points and two workers. The third will give you fifteen points and three workers. You score is based on how many denizens of a location exist at the time you add someone, and point scores rack up quickly But what does that even mean? Just because we have ten innkeepers it doesn’t mean more people are coming to stay. We might make a thousand loaves of bread, but we’re still only going to sell the same number of sandwiches. It’s not that the theme here is a veneer, but rather it’s a veneer that makes zero logical sense. 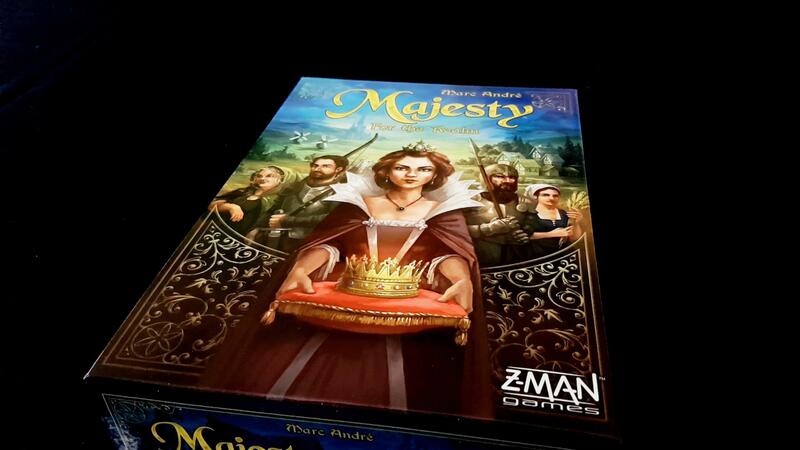 Majesty is the sort of ‘game as propaganda’ you’d play in an economics class where the lecturer is a Romanov. ‘The solution to excess’, begins the lecture, ‘is more excess’. There’s more than just points for you at stake too. The brewer will give you two points and a worker, and then anyone at the table with at least one miller gets two points. 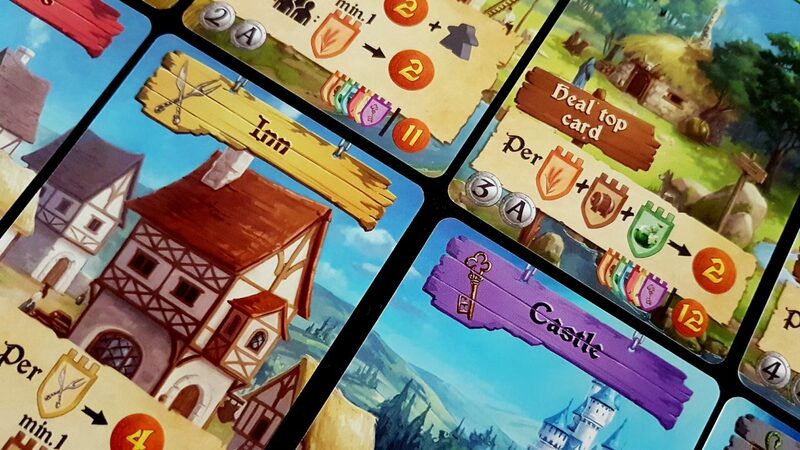 Every guard, soldier and innkeeper gets you two points when you assign someone to the guardhouse, whereas the cottage is two points for each miller, brewer and witch. And as with the noblewoman, those points dramatically mount up the more people you have. This is a system that rewards, and well, those that specialise in a single industry. Even to the point of obvious economic ruination. Some cards also have secondary effects. Consider the barracks, which sends the leftmost worker in an opponent’s village to the hospital, and the guardhouse which protects against enemy knights. The cottage will heal the topmost card in the hospital, sending it back to work. It’s a slim roster of additional effects, but it adds a PvP element of sorts The problem there is that this slim approximation of player interaction manages in the end to be almost entirely irrelevant. You don’t lose score when people are sent to hospital, you just lose them from the location until they’re healed up. That barely matters because you’ve got so long to repair what scant damage has been inflicted. Games of Thrones this most certainly is not. I have made a point in the past with regards to some of the most interesting tableau builders that they often reach their crescendo before you get a chance to really see the engine you have built rev up and pick up speed. 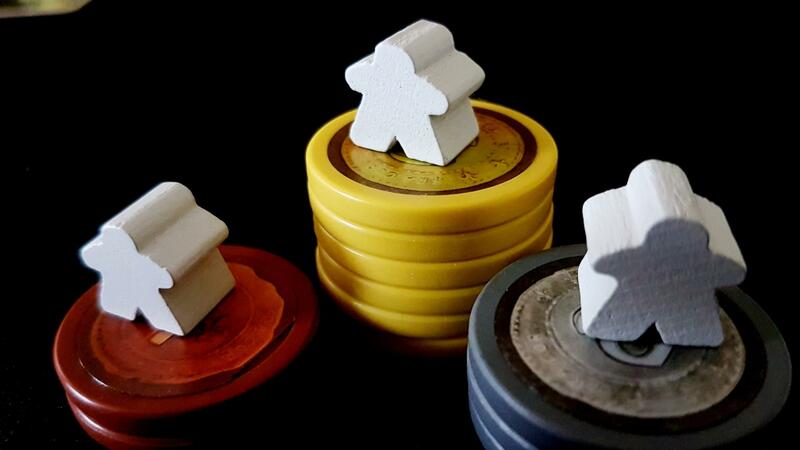 San Juan and Race for the Galaxy both have this same frustrated ambition at their core – that the game lasts until the final piece is placed into the engine and then it’s all scored up. That means the time you get to build your actual engine is truncated. It’s intentional – it means you’re always tense during play. You never get to wake up your Frankenstein monster and send it lurching off into the village. At best you have to satisfy yourself with a pair of working legs that can maybe make it down the stairs. These games work though because they offer so many viable paths to victory, and often the optimal one isn’t even in your control. You look at your hand of cards and think ‘Ah, I see what kind of game I need to play here’. They give you a push in a particular direction and it’s entirely up to you to turn that imparted momentum into progress towards a suitable goal. And gradually what you’ll find is that you don’t have many real choices at all. No real options. In every game we have played of Majesty we have ended up with villages that were practically identical except for a slight emphasis in one location versus another. In Race for the Galaxy I can see a photo of a tableau I have built and say ‘Ah yes, my dystopian space empire where the ruling classes subjugated aliens for their lucrative luxury goods’. I can remember the way the cards fit together. I can see how its pieces were meant to work. I might even remember the game itself, although after hundreds of sessions I wouldn’t like to put money on it . If you showed me a photo of my village versus someone else’s village a mere hour after a game of Majesty I’d not be able to tell you which of them was mine. There are a few games where the distribution of cards creates a more memorable situation, but not as often as you might think. You go deep on knights so I go deep on guards. You give up the guardhouse in order to claim the barracks, and vice versa. Maybe one round you got three nobles and I got three brewers. But more often what happens is we each have at least one person in each location, and convenience dictates the rest. You pick the cards – and score the locations – that you can conveniently afford. This seems like an attempt at a magical incantation aimed at summoning an echo of the past. ‘Splendor was successful. Many people said the weighted chips were important. 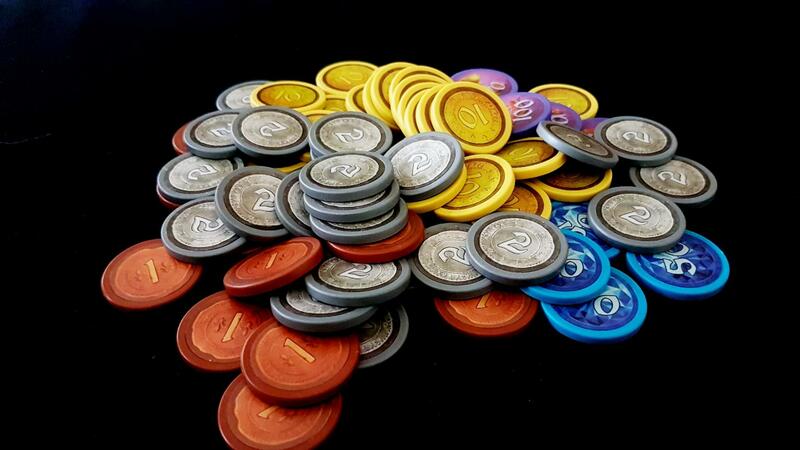 We must include weighted chips in this game, because that will make Majesty successful’. Unfortunately, it doesn’t actually help the game at all. In fact, it makes the game intensely more irritating because most of what you spend your time doing in Majesty is making change. And, even more annoyingly, making change using profoundly unhelpful denominations. Let’s say you place a noble woman. You get five points for that, good for you. So you go to grab the five point token to find… what? There isn’t one? No, how… you’ve got one, two, ten, fifty and one hundred. It’s the most inconvenient choice of point values and it has led, in every game we have played, to an inordinate amount of uncomplimentary muttering. When so much effort is lavished on a component only for it to generate angst and dissatisfaction it’s clear to see something has gone wrong with the process somewhere. If your flagship feature has people cannibalizing other boxes for better alternatives, you know you’re not on to a winner. You accumulate these chips in such volumes, and they’re provided in such miserly quantities, that they are actively to the game’s detriment. None of this is to say that Majesty is a bad game. It isn’t. All the pieces here fit together reasonably well. The exponenting point totals are fun, and there is a certain quiet satisfaction that comes with finding solutions to the minor optimization challenges the game puts your way. You don’t come away from playing Majesty feeling aggrieved. It’s not an unpleasant experience. Majesty’s biggest sin is that its an unjustifiable opportunity cost. Every minute you spend playing Majesty is a minute you’re not playing a better game, and you’ve got precious few of those minutes in your life. You should spend those minutes with a game that is going to set your nerves on fire. One where every session is so rich and energetic that it will stay with you forever. Mere technical competence is too low a bar to set for a game these days. You want a game with ideas, innovation, and the confidence to deliver on both. Majesty in the end is like a Vegas lounge band with a catalogue full of middle-of-the-road cover songs. Sure, they meet all the technical requirements of offering ‘entertainment’. You could go see them and come away passably diverted. Right next door though there’s a magician who can project a giant version of the card you chose onto the surface of the sun, and she’s only the opening act. You deserve to do more with your time than simply wile it away and Majesty isn’t really up to that challenge.